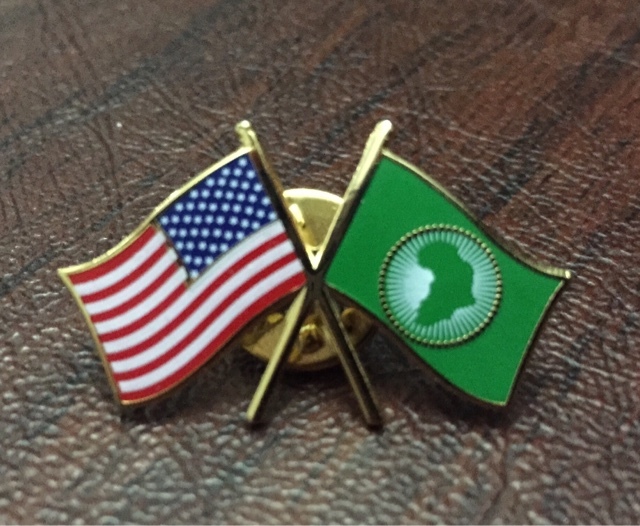 The friendship flag pin is a classic piece of standard diplomatic kit. American embassies always have a stock of the pins, the U.S. flag crossed with the flag of the host country. Or, in my current job, the flag of the African Union. I keep a stash in my bag to have on my lapel for meetings and official events so people can tell at a glance who, and what, I represent. Other countries do flag pins too. There are flags on ambassadorial cars, on business cards, on embassy signs, everywhere. Especially here in Addis, seat of the African Union and one of the biggest diplomatic capitals in the world, where embassies are key navigational landmarks, there are a LOT of flags. But they're only helpful if you know what they mean. 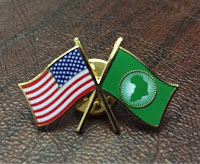 I've blogged before about how much geography - especially African geography - I've learned since I joined the Foreign Service. I've pretty much got the African countries and capital cities now, but the flags are proving challenging. So many of them are so alike! There's a reason for this. When African countries started gaining independence in the mid-20th century many of them took their flag inspirations either from the red, black, and green Pan-African flag, or the red, gold, and green flag of Ethiopia, the continent's longest-standing independent country. The red/gold/green ones are especially tricky, often distinguished only by the order of the stripes and/or the presence or absence of stars. Here's an African flag quiz if you want to get a sample of what I'm dealing with here. But it's worse than that really because there are over 100 diplomatic missions in Addis, not just the African Union member states. This is is where it becomes relevant that the flags of India and Niger are hard to distinguish from a distance, and that Cote d'Ivoire's flag is the same as Ireland's, but backwards. Some of the North African countries' flags use the Pan-Arab colors, which makes them easy to confuse with the flags of various Middle Eastern countries who also have embassies here. Chad's flag is IDENTICAL to Romania's except for a slightly different shade of blue, and yes, they both have embassies here.